An event-based adventure for 5th-level characters. Falcon's Hollow has long been watched by the vile fey of Darkmoon Vale. They've lingered in their wood, seething with anger at the townspeople for defiling their land. When the carnival arrives, the fey finally see their chance for vengeance. Carnival of Tears is a low-level, event-based adventure written by Nicolas Logue and Tim Hitchcock that pits the players against a band of wretched fey who have infiltrated a carnival in order to unleash their anger on Falcon's Hollow. When the heroes uncover the dark secrets within, will they act in time to prevent Falcon's Hollow from becoming the carnival's final patrons? This is absolutely insane, so I can't recommend CoT especially for teenagers. However, personally, I have never met scenario like this, and I could never be shocked as. I shower with five stars. Just wow. This was worth the purchase just to read. This is not for the faint of heart or looking for traditional gameplay. This is also not for those who "win" everytime. Their is a since of "failure" but tbh its needed bc tbe town basically deserves it and to add to the tone of the story. Great fun for the emotionally disturbed! 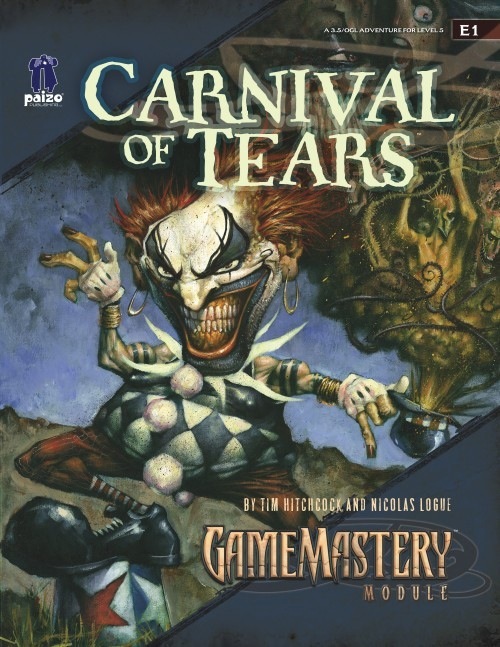 Carnival of Tears is like a slasher movie, a Clive Barker novel, a Stephan King novel, and a Conan the Barbarian novel all rolled into one. It is thick ghastly images, screwed-up monsters, and blood-curdling supernatural horror, all spiced with a hint of heroic fantasy. It is however, a little shallow. The players fight horrifying fey while navigating a bleak carnival, and that's about it. There is no intrigue to speak of, and the writers turn more and more to shock value to keep the players engaged. Overall, I would recommend it to fans of horror media and dark fairy tales, but not to players looking for a "traditional" fantasy romp. Yes, it's gory. Yes, it's horrific. Yes, it's shocking. That's rather the point. If you've not played something by Nick Logue before, tread carefully. Same goes for Richard Pett. These two together? Recipe for horror beyond imagination. I loved it. Oh my, the Quickling just might sell this module to me. I've got a campaign running and the current BBEG is a Quickling named Asyr'Ala. I'd love to have a little bit more stuff on Quicklings if I could, but then there is the time it will take the module to get to the Netherlands. So what should I do? ... but then there is the time it will take the module to get to the Netherlands. So what should I do? Hopefully Paizo will state that they used very similar stats to the ones I found at EN World. Cos those are the stats I'm using. We used the OGL stats from the revised Tome of Horror. Fairly disappointed with this one. It continues Logue's bloodthirsty approach from previous modules, and at the end of the module, the best case scenario involves about a hundred people dead and all the main NPCs turning to evil. It's always the same with his modules - no matter what happens, people who were innocent or pure get corrupted (see D1, Path3, etc.). Is there a way to exclude his modules from the Gamemastery subscription service? It's gotten to the point now where I know I won't like his modules. Heh. A Non-Logue Subscription. Ouch. This is just a weird streak of em. Edge of Anarchy is NOTHING like that. Also, some stuff I have coming up for DI Dungeon isn't either. These three just turned out pretty grim. Sorry they didn't do it for you jwl. Hangman's Noose is grim, but there's plenty of chance for redemption and a sunnier ending to a dark tale in that one. I'll agree with the ouch. E1 is a horrifying mess of death and destruction. If I were to run more games for kids, I'd use D1 but not E1. Don't get me wrong, I love the module for what it is, and what is isn't is kid friendly fare. I do look forward to a more cheerful module from you Nick. I'm convinced Ari Marmel can't write anything cheerful, and don't want to pigeon hole you with the same thing. Sorry you didn't like Carnival of Tears. Nick and I were shooting for creating really bad villains that do really bad things. You know, evil-doers that players might want to stop, being able to save people rather than just find the princess and get the gold. Anyway, that was our intent. Personally, I live in a real world where in order to survive i need to run around like a chicken with my head cut off just in order to get money; and where people kill thousands of other people and get away with it; so I naturally jump at the chance to work with some like Nick who can create an adventure where characters aren't motivated by greed and can actually stop the wholesale slaughter of humanity. Actually, I find him quite uplifting. As far as being one-sided. Nick's work and themes are incredibly diverse...and all his stuff makes for great adventures. His themes are dynamic and dramatic, and after a scores of work never once has he resorted to anything hackneyed, cliche, or average. His NPCs are all motivated by big things; emotions like love, vengeance, betrayal and redemption. Not I'm a bad guy who worships an evil god and that's why I'm bad. In Mask of Diamond Tears its all about fighting alternate universe PCs. Sure, I'm admittedly biased when it comes to Nick's work, but I met Nick through his writing and it was part of what I love so much about him as a person. That you find his work depressing just confounds me, as he happens to be one of the most positive and uplifting people I know. And after playing in his games (or running one of them), I walk feeling the same way. I like the module. I may run the module. But I won't be as grim with the ending. Look, I like the idea that the PC's want to save people, and I think it's a nice touch that they can't save everybody, but I want the party to like Falcon's Hollow, to think of it as home base. And the butchery in the module as written is breath-taking. At best, there are somewhere around a hundred people dead. If the PC's guess wrong about where to go, or move too slowly to collect enough virtue points early in the adventure, it could mean hundreds of people, half the town, gruesomely murdered, and the rest traumatized. As you say, I want them to be able to save people, not just walk away with a kick-boot frosty-keen sword. And in the module, they can't. The major NPC's turning either grim or just plain evil --all of them, with no means for the PC's to redeem them-- is another blow. Anyway, that's why I (speaking for myself) found the adventure depressing as hell. By the way, there's a character who "loosed the evil" with his / her careless wish. I found it surprising that this character doesn't really pay any price for that. It goes against everything I understand about the tropes of fairy tales, what Le Guin calls "the language of the night". Chris! No worries my man. Adapt away. It is pretty grim, but that's what being a hero is all about...at the same time, the beauty of our medium is that if it doesn't work for you, you can change it for your players. Go for it my man! On the "loosed the evil" topic...if you mean Namdrin, he pays the ultimate price - his love he fights so hard to get back, ends up hating him for what he did...far worse than losing her in the first place - which is why I did that. Think about it, it's ugly. No, that's not whom I mean. I mean the person who gave the bad guys permission to attack the humans in the first place. Oh you mean the witch-queen (yeah I know witch-queen, hitch-queen I've already heard the joke). We pictured her as more of a big epic type of villianess. Perhaps like a fey Baba-Yaga or something. So fighting her would be inappropriate for lower-level characters. Still, that shouldn't stop you from creating/running a get the witchqueen adventure of your own concoction. HEADLESS from Dungeon 89. Just add a few cold riders, and slap an unseelie template (from GR Advanced Bestiary) on the adventure's derro antagonist. Make the Deadgates open into an unseelie realm of unspeakable cold and the Carnival only the antagonist's primary attempt to collect heads to open the gate. Unfortunately for us freelancers, she's not in the SRD. Oh you mean the witch-queen. We pictured her as more of a big epic type of villianess. Perhaps like a fey Baba-Yaga or something. So fighting her would be inappropriate for lower-level characters. Syntira, the "Jennifer Love Hewitt look-alike" nymph queen of Darkmoon Vale. It was she who loosed the Cold Rider upon the people of Falcon's Hollow, and she who now regrets it. Regret all she likes, all she does is, perhaps, give the PC's a potion that protects them from the functions of an artifact. and, again, if the party is slow or unlucky during the first two parts of the adventure, she does nothing to stop the slaughter. This isn't about the party going after the character and "getting" him / her. It's about the character standing tall and doing what's necessary to make things right. If anyone should be standing next to the PC's when they finally confront the Cold Rider and his minions, it should be the character who now regrets letting him work his will here. If anybody dies in this adventure, it shouldn't be hundreds of innocent townsfolk. It should be the character responsible. If the character is supposed to come off as a heartless "epic villainess" who actually agrees with the Cold Rider, that doesn't come through the writing at all. Syntaria isn't really evil, she's just retaliating against the humans who are ruthlessly destroying her homelands and her people. The townsfolk aren't innocent, there just as guilty as the lumberbarons for supporting them in their wholesale slaughter of her people. Its her vengeance upon their greed!!!! Death to the townsfolk!!!! We were going for a horrific and tragic ending. In my mind, such tragedy makes lower level characters motivated to become real heros at higher levels. Tragic loss is a powerful theme, however, if you want a more friendly version of the module, a few modifications could make it work for you. Rather than innocent townsfolk, have Quinn first test the Carnival of Carnage on a group of undesireables; preferably all people working for the lumber barons. These could be hardened criminals, purchased into endentured servitude; a tribe of evil half-orcs and goblins that hack forests appart for the lumber barons; or troop of mercenaries that kill and clear fey out of the valley for the loggers. Players discover the plan while the fey give it a test drive, preventing the good people from ever arriving. Proving to the villainess that the evil fey intend to perform these same acts of violence on innocents, makes her have a change of heart. That way she doesn't come across so capricious. Also, what you're dealing with is a repentive villain (which is pretty cool). There's no reason why she shouldn't be asked to stand trial, or otherwise pay for her crimes. Perhaps when called to the carpet about her role in these crimes, she could suddenly sour again and launch a new attack. Then the players can kill her. but seriously, your players NEED to encounter twin grimlock pin-heads wearing dresses and singing happy songs. Don't let a few potentially dead townsfolk stop them from that wonderful experiance. Tim, I'm having a hard time distinguishing between your serious suggestions and your flippant comments. I hope this is flippant. If we make this change, then that alters the entire theme of the adventure. This becomes a war, and the PC's --particlarly any elves, gnomes, or fey in the party-- might very well side with the Cld Rider against the humans. My objections didn't have a lot to do with tragic loss, but, since you bring it up. There's not a lot of focus in E1 on tragic loss. Oh, there's puh-lenty of loss, but it's not the party's fault. Tragedy has to do with decisions and ramifications. (Think Oedipus. Think Macbeth. Think Annikin Skywalker.) The massacre in E1 is bathos, not tragedy. It would be tragedy, if Syntira were the protagonist. But she's a side character. Tim, that would be a terrible change. Are the Pc's supposed to approve of the grusome murders of "undesirables", logger folk, and slaves? Are they supposed to say, "Well, it's okay to torture those people to death but not these other folks?" Syntira doesn't come across as capricous. She was angry, she made a deal in the heat of the moment, and now she regrets that. That's fine, that's all the character we need. If she regrets it before any murders take place, she's sympathetic. If she approves of the first wave of sadistic butchery, that makes her...something else. Also, what you're dealing with is a repentive villain (which is pretty cool). There's no reason why she shouldn't be asked to stand trial, or otherwise pay for her crimes. Tim, picture The Return of the Jedi, except that, when the Emperor decided to just kill Luke with force lightning, and Darth Vader sees his son dying, and has a change of heart, instead of paying the price, stepping into the line of fire, he just stands there, regretting things, waitching Luke and a whole lot of rebel pilots die. Finally, when the ground crew gets the foce fields down, and the reels win, Vader comes clean and stands trial. Syntira is in, perhaps, the same situation that Lando Calrissian was in, when the Empre invaded the Cloud City and he realized that he'd been siding with the bad guys and things were about to get really bad. Lando thre away everything he cared about, to try to make up for his mistake, and Han still gave him crap. Syntira neds to make the same choice. But fey are a misdirection-type. How can Syntira pay the price for her rash deal? She's not going to swing a light sabre or go picking up the Cold Rider and throwing him into a reactor core. That's the PC's job. Should I run this adventure, here's what I'll do. After the massacre, most of the first hunded victims will show up, snug in their beds, with no memory of the evening. It will turn out that Syntira asked several of her most loyal fey, including her own children, to become changelings, voluntarily sacrificing themselves to make up for her mistake. So the first wave of deaths will be Syntira's sacrifice. Any other deaths will come out of the human population, the ones the PC's can save. If the party fails to do so, then those are indeed tragic losses. Perhaps when called to the carpet about her role in these crimes, she could suddenly sour again and launch a new attack. Then the players can kill her. I half agree with both arguments, on the one hand it does seem that despite doing everything right there is still a massacre, so the players end up feeling like they failed. On the other hand -it is an attack by a powerful evil magical creature and his hoard against the townsfolk so if some people die that makes sense. Say It had been a more standard attack ie a dragon a few powerful henchies and a humanoid hoard attack Falcons Hollow. the players kill the dragon, the henchies and beat off the hoard in a marvellously efficient way - it would still be reasonable to say some townsfolk died. This scenario just has a more tricksy villian. Thanks, I'm going to look those up. And to add to the Queen of Air and Darkness thing. She's definately in the Public Domain. You would only have to stat her out and make her your own. Hm. How about a only-Logue Subscription? I think I have to get this one. The way things went in my Crown of the kobold king-game, the people of Falcon's hollow deserve a beating. Hmmm. Yes. Me too. A Logue-only subscription of high-tragedy adventures (as in high fantasy, but better). My players "love to hate" Falcon's Hollow. I finished running D0 in our not-campaign game sessions, and I'm currently halfway in D1. The characters are smelling the very possibility of a tragic ending, and sometimes my players ask for a moment of respite just to gasp some fresh air - all the while being enthusiasts about the themed games. I'm currently considering dismissing the Red Hand of Doom sequel I had in mind, just to give them another taste of the Falcon's desperate atmosphere. Yes. Unfortunately my players are already way past 5th level (going through Conquest of the bloodsworn vale), so I think I have to modify the adventure for a bit higher level adventurers. Sweet part is that I'm able to include some of the campaign seeds at the end of the Kobold king, to make things even more desperate. Biggest problem is that I'm not sure if my players want to save Falcon's hollow anymore, they might just join the other side =). Hm. Guess I'll have to go and buy this module now. Sounds like my kind of adventure. I've been seeing a lot of "Won't Logue think of the Children?!?" type posts on these boards lately. It really makes me wanna buy more of his work. While based on my flippantcy, I'm thinking the whole war scenario would actually be pretty cool... My players would love a game like that. As far as the rest of the work goes, sorry you didn't like it. I wasn't really trying to defend it as much as offer a few suggestions on how you could better get it to meet your particular aesthetic. Sorry, I can't offer you more on that front. Check out Mortika idea about the fey war!!! I definitely need to scope this thing out. Sort of like the Terry Goodkind series, where he sends his army (the smaller of the 2) into the invader's homeland to wreak havoc on the supply trains and farms. "Don't think of it as killing innocents, there are no innocents. By Being quiet and supplying the army, the farmers are as much part of the army as the soldiers, and for every one farm you burn down many soldiers will starve to death, saveing your neighbor from facing them when the battle for the keep comes and their army tries to roll over us! Every prostitute killed, and the worse moral becomes, and the colder the winter becomes in their beds, causing more battles amongst each other and some to freeze to death"
The tragedy in E1 is not the party's fault, that is true, but it is still tragedy. For the townsfolk, their greed and carelessness has led to aggravating the native creatures that dwell within the paradise they have despoiled. Do they deserve the punishment that the fey are delivering? Perhaps not, but it was their arrogance that caused the situation in the first place, and the whole point about fey is that their values and morals are not the same as humans. To there minds, mortal lives are of little significants next to the eternal beauty of the forest. To them, wiping out Falcon's Hollow is less than the humans deserve for the damage they have caused, which will take centuries for the fey to heal, even without further interference. Can you truly say that Oedipus deserved what happened to him? Although he may have acted in ignorance, like the people of Falcon's Hollow, it was his actions that nonetheless created the situation that led to his description, just like Falcon's Hollow (except for the timely intervention of the PCs). Of course, the saddest part is that the common townsfolk had little say in organizing the destruction that they are being punished for, but that is often the way that war works. The (relatively) innocent are usually the first to suffer. As for claiming that Syntaria does not suffer from what happens in the module, I have to disagree there as well. First, she watches her beautiful and happy children transform into evil twisted creatures of frozen darkness before her eyes, and she is powerless to halt the transformation. Then she has to make a terrible choice, allow the (admittedly unjust) punishment to go forward, or betray her own people to her hated enemies, and watch as the careless and destructive humans slaughter many of her own kin (whose lives, I might add, she values more than the lives of the entire population of the town). At the end, if the PCs fail, she pays almost as heavy a price as the town, as her fey desert her and join the heartless armies of the witch queen, and her territory is transformed from a paradise into a frozen wasteland. If the PCs succeed, she is rewarded for her act of treachery by being forced to watch the harvest of her forest continue, knowing that, unless some miracle happens, it is only a matter of time (and for an immortal fey, not a very long time) before the forest is completely destroyed, and she and her fey kin face exile and death. As for those who say the module is too dark, well, it is pretty dark. But, the good news on that front is we aren't planning on doing something quite so grim again for awhile. Hm, a fey war sounds actually quite good. My players were a bit lost when I took them away from Falcon's hollow and into the Bloodsworn vale. It has been at least four months when their characters left Falcon's hollow, so returning there now and realizing things have changed for even worse sounds like a good scenario. I also have a druid in the party who already in Kobold king wanted to show some justice to the lumberjacks... Now all I need is the module to show up in my FLGS =). She is the fey deity of Magic (especially illusions), Darkness and Murder. The Queen’s Unseelie Court can be found on Pandemonium. Would this be a good short stat for the Queen? I'll admit that this has been my least favorite GM module yet.
. I like the concept of the Fey attacking the fair, but the execution (pun intended) feels forced. Having the fey at the ticket booths decorate with villagers faces... just screams B movie. The frosty chislers...like bad Bond villans don't kill their enemies immediately, providing for the chance of rescue. The problem with this type of adventure is that since the gaming group is sitting down to game, the players know that there is going to be something wrong at the carnival. It is not like they would expect to play a session of actually strolling around the state fair. Because of that, it is pretty obvious where the future incidents will be happening. Releasing caged and resentfull freakshow acts would have been more believable. Having some sort of beast crash up through the ice of the lake would have been more unexpected. Or maybe having something like two logging gangs begining a confrontation at the fair only to have the fey attack, would keep the players more off their guard, and set up a chance to recruit some allies against the fey...perhaps to then have the stronger surviving logging team take advantage of the victory and turn on the party. The goofy adaptions of the existing attractions just doesn't work for me. It is like the second half of the movie "Dusk to Dawn". Heh, all your reasons why you didn't like it makes me want to get this module even more. I have a druid *and* a ranger, who are both very upset with the lumber consortium. My plan was to run them thru E1, then W1, then J1, but I like the idea of an Evil Fey Witch Queen and bringing them back to Falcon's Hollow, after W1 and taking on both the consortium and the Fey Witch Queen (not Syntaria) and having the consortium be more conservation minded. I'll do you one better with Hangman I hope ASEO. CT18 Tent of Illusions - I don't think this is included in the module, having checked a few times. Perhaps Mr Logue can advise what he intended for it? If it is there, perhaps someone can point me to the right place. Originally there was an illusionist ally of Namdrin's who went all fey-crazy too. The tent of illusions is where he entertained patrons with wild displays of chicanery and legerdemain, of course when the Carnival goes dark and bloody he starts casting phantasmal killer and worse on people. Here Jozial Mooncloak, long time Nightshade and friend to Namdrin Quinn, offers private performances for the well-coined, wherein he creates their wildest dreams or darkest fantasies. Of course the fantastical performances always end with the subject’s desires turning into their most horrible fears. He tailors his illusions to the specific requests of his high-paying clients. For the unimaginative he offers such depraved faire as half-naked priestesses of Imodae armed with cat’o’nine tails and much ointment, or a well-endowed bugbear bound to an iron frame, mewling out for release. Once his patrons give in to the throes of ecstasy, he conjures up horrid beasts with his wand of shadow conjuration to tear them apart. Jozial was once a rakish traveling illusionist taking his pleasures where he pleased and often resorting to robbery to make his way in the world. He came to love adventuring more than petty crime under Namdrin and Tessa’s tutelage. He wants nothing more to return to the Vale for adventure and glory, but he feels he must pay his debt to Namdrin first by helping him save his wife. To this end, he grimly aids the fey in their brutal murders, in hopes it will restore his loyal friend’s wife back to him. In the meantime he takes what pleasure he can in resorting to mayhem and murder once more. Before Combat Casts cat’s grace, false life, fox’s cunning, shield and mage armor (all figured into his stats already). He also casts greater invisibility followed by ventriloquism allowing him to remain invisible as he attacks and throw his voice about the area to further confound his foes. During Combat Jozial uses his wand of shadow conjuration to “summon” a bevy of nightmarish monsters (fiendish apes, fiendish constrictor snakes, hell hounds, fiendish huge monstrous centipedes, and dretchs are his favorites), he allows them to do his dirty work for him but supplements their attacks with black tentacles, hold person, and rays of enfeeblement. He moves about and throws his voice elsewhere throughout the battle to elude attackers. Morale Jozial is not suicidal and flees if reduced to less than 10 hp. Many thanks for this - I actually added the fortuneteller and an unnamed illusionist into the tent running an unspectacular "sawing in half" show, so I had something to run there. They have just met Syntara, so I can use what you suggest for the second half of the scenario, if they head up in that direction! Hollin ran off, when he saw his sister and one of the party got thrown out of the tent by Kabran Bloodeye, when he tried to rescue Ralla. What will happen next I have no idea...was thinking too of bringing Savram's father into it somehow, as the party were unable to save him in D1. Lastly, do we have natural progression module coming up for E1 and the lower caverns in the Kobold lair scheduled? We are half way through the module, and we're liking it. We started it on Easter and will finish next week (a "two shot", I guess). The powergamer in the party decided to try a spiked armor wearing grappling half-orc, and it worked very nicely. After the fireworks went off, I started playing Tom Waits' The Black Rider and Frank's Wild Years in the background. My players liked it. I'm a bit concerned about the last fight, though. As all of this takes place on the same day, the party is already scared of tackling more fights for fear of wasting all their healing and all their remaining spells... Having it all happen on the same day really puts spellcasters on their toes! Well we're nearing completion on this one now after about 4-5 weeks of running it on-line. All in all, I think the module has worked very well. I warned the players that it was fairly adult in nature and somewhat savage, but this has meant that the players have been really eager to put an end to the massacre. This week I had Kimi Eavewalker almost drown when the big wheel crashed into the lake. She was rescued on the brink of drowning and then Prig threatened to drop an area effect bead of force around the group tending to the dying girl. The players weren't happy! The second half does, I think, need a bit of a breather in it. The pie area could do this a bit more, but it did provide a slightly easier combat, which helped the party recuperate a bit. It has aside from this been very relentless and a little hard to get into roleplaying under this constant pressure. The ice shard issue wasn't picked up by the party either and so this meant that they tackled rather more of the challenges in the carnival before any assistance arrived, so maybe a little more of a hint in Syntira's speech would be useful on this, especially since she knows all about it. I toned down the frosty chisellers a tiny bit. Having their beards do damage seemed a bit overkill, considering they have so many other abilities. The dark ice brownies are just right. They are a bit easier than the roseblood sprites in W1, but not much, with their powerful frost attack. I guess we'll see next week how well they tackle the boss. The group will breathe a sigh of relief when the module is over - in a good way I think! The party went to see the nymph, who turned Quinn blind, with no way to fix this without spending a night. He isn't too effect a fighter against the bad guy in the end, but it would have helped if he had done more than just cast Haste plus some singing. Should have given him Blind Fight! Damn! I thought I did actually. Nope, that's right, had to get rid of it because Shadowdancer EATS UP THOSE FEATS in the prerequisites man! CURSE YOU SHADOWDANCER!!! The player of the grappling barbarian in my game also commented on my website where I have my review (as Paizo only allows 2000 characters I had to shorten it a bit). I really liked the atmosphere of the adventure. Not something I would necessarily want to run over a campaign, but for a one-shot it was perfect. The somewhat bitter ending (we did pretty well, only allowing ~250 deaths) left me a bit crestfallen, especially moments after I grappled the [final foe], killed him with one last twist of the armor spikes, and ripped off his helm! But clearly that was an important theme of the adventure, and like I said, I really liked the overall flavor. The war of attrition was a bit tough, I think. [...] As the grappling barbarian, I ended up being healed for 170 points of damage over the course of the adventure (3.5 times my hit points, hehe). Wands were not helpful, they were necessary. The possibility of permanent blindness and the persistent ability damage of the poison magnifies the fatigue the party must endure over the course of the adventure. I think if we had found more clever and non-combat ways of solving problems, we would not have been in nearly as bad a shape. It was unclear to me how many options were specifically called out in the text, or how much of it would have relied on us convincing the DM to let us try something. In any case, we solved most situations by violence (which suited my barbarian fine). The adventure plays out like the lovechild of Monty Python and Silent Hill - very weird, very scary! The art, layout, maps, new monsters, box-outs are all excellent. The background setting frames the adventure nicely but can easily be substituted for your own. The best feature of the adventure is the event-based set up. This means that the PCs never wander off course as they choose where to go next. Even better than that is because everything is nicely segmented, you can take out any number of the encounters as 'set pieces' and run them in your own adventure with no problems. This also means that if your player's favourite show survives the climatic slaughter, you can use them again as they return with a new act and as the centre piece of a new fairground. Warning: the ending can be pretty bleak if the PCs don't do so well. 5/5! Well done to all involved! "The problem with this type of adventure is that since the gaming group is sitting down to game, the players know that there is going to be something wrong at the carnival. It is not like they would expect to play a session of actually strolling around the state fair. Because of that, it is pretty obvious where the future incidents will be happening." Actually, in my campaign, spending an entire session on character-building happens frequently enough that this could work as a huge surprise. Anyone have suggestions on adapting this adventure for 7th-8th level adventurers? Having just read the adventure I must say that it is brilliantly sick. My players will be horrified. How can the players even hope to keep the death toll under 100? The carnival kills 350 people per hour. That is 5.8 per minute. That gives the players a mere 17 minutes (170 rounds)to keep the toll under 100. Any one actually have their party keep it under 100 casualties? Two thumbs way up on this one! This dark tale will definitely get my players blood going, seeing that already they have done a few WTF from Crown of the Kobold King (Thanx Nick). Tim & Nick both have nicely set the bar for horror with this one, not for the faint of heart and those ol fans of Ravenloft (I know your still out there) will feel a bit of nostalgia when they get creeped out by the events at the carnival!